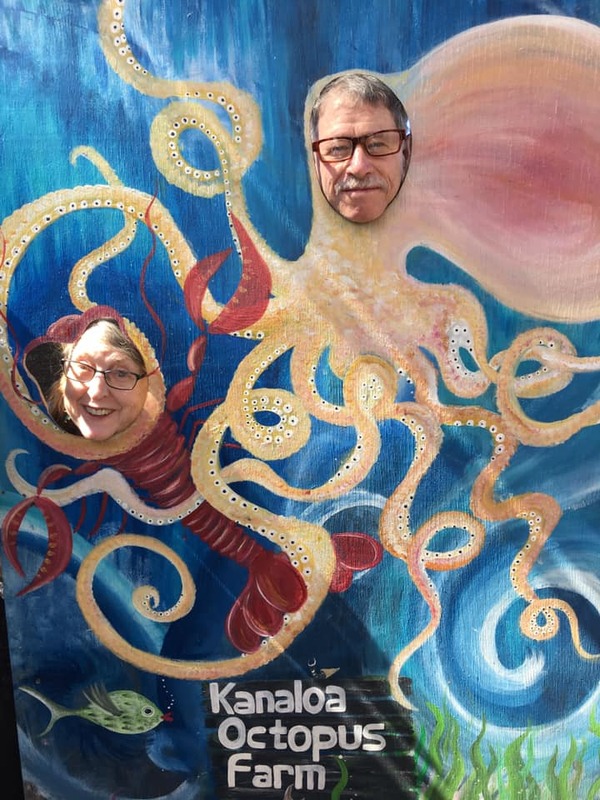 Bonnie and I prepare to meet the octopuses. It was our friend Fred's fault, really -- he was here about a week ago, on a vacation trip from Annapolis, and said we'd really like a cephalopod experience, specifically the Kanaloa Octopus Farm on the western tip of Kona near the laid-back international airport. The tickets are mostly sold online, at $30 per adult, to reserve a spot for a very odd farm tour offered just twice a day, at 10 a.m. and 2 p.m. You drive down Kaiminani Road, and hang a right on Makako Bay Drive, past a scenic ocean beach and a line of industrial-looking buildings that are part of the Hawai'i Ocean Science and Technology Park. Past the abalone farm, past the lobster farm, through the gate and left to a small row of parking spots next to a structure that could pass for the entrance to a circus sideshow. But it is really the gift shop, and a crowd of close to 30 people, including several young children, slowly assembles there for the afternoon tour led by a budding young marine biologist named Marki. We decided not to buy any of the adorable stuffed animal octopuses or other merchandise, including the $20 octopus farm coffee mug... guaranteed to be a conversation piece. Marki leads us past three aquarium tanks inhabitated by a few pretty fish, but no apparent cephalopoids, to a large enclosure lined with a double row of tubs... most of them containing one adult octopus, and most of the critters hiding in a little domed rock "cave" at the bottom. They have toys floating on the surface, like rubber duckies, a rubber elephant, a red fishing line float. After washing hands to remove the likes of dirt, lotions or other contaminants, visitors are instructed to gently wiggle fingers in the water to spark the curiosity of the octopuses, each of which has a name posted on the side of its tank. And after a few minutes they glided out of their caves and extended sucker-lined tentacles toward the surface... and the fingers. And as they feel, or attach suckers to pull at the fingers, you get to play with them. Several of the children squealed nervously, even pulling back their hands, at first contact. Because these boneless creatures are rather eerie. And you get a sense that these octopuses are both self-aware, and intelligent in their interactions. Marki said anyone with an underwater camera could use it in the tub, but cautioned that the octopuses would likely try to grab it and try their tentacles at taking selfies. A tiny GoPro camera was a big hit, and the animal's' attempt to wrest it away from a father's hand doubtless made for a thrilling video. My playful pal Monty changes color from spotted brown to white. I cannot remember the name of my first octopus. But when it tired of my fingers, I turned to an adjacent tank and met the rambunctious Monty. He was a tease, tugging at my fingers, then gliding back, and repeating the game, and as I made a little close eye contact he expelled a burst of water like firing an internal water gun. He missed. And then he tried again, and missed again. My favorite, though, was the littler Lily, who seemed to enjoy tentacular cudding with my left hand (see video below). There was also an opportunity to feed them, and the creatures seem to sense after 15 minutes of play with their visitors that chow time has arrived. They pluck bits of crab from fingertips and use their tentacles to place them in their beak-like mouth. 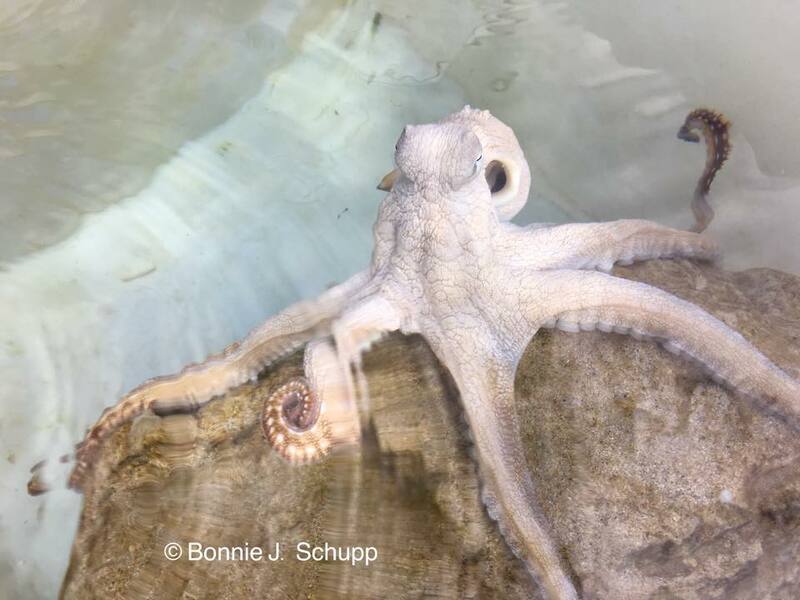 Octopuses are found on the ocean shelf off the Kona coast, and the farm specimens mostly were caught and brought in by commercial fishing crews. But most octopuses caught at sea do not fare as well, ending up on dinner plates. Many folks consider them a delicacy. The money from tour tickets, and sales in the gift shop, support the octopus farm's experimental efforts at breeding the creatures in captivity, and trying -- so far without success -- to raise them from hatchlings so tiny that they become distinguishable only under magnification. Marki sucked up more than a dozen from a tank using an eye-dropper, and put them in a tiny pool on a slide under a microscope. The teeny swimmers looked like squid. Unfortunately, Marki said, the farm has been unable to get beyond 12 days of survival before these infant octopuses perish. And there's a lot of death here. A female produces hundreds of thousands of eggs. The farm is awaiting the arrival of new equipment that will circulate the cold ocean water pumped in from the nearby seabed -- a necessity at keeping the babes alive. And eventually, if the scientific hurdles are overcome, there's hope of creating a sustainable supply of octopuses for the market instead of taking them in large numbers from the sea. Meanwhile, Monty, Lily and friends aren't going anywhere in the restaurant kingdom... or anywhere else, barring an improbable getaway. Marki said there are occasional escapes from the tubs, but they flounder on the stones underfoot in the farm, spread their tentacles out helplessly and quickly begin to dry out in the warm Kona environment. They breathe through gills, like fish, and must be picked up and returned to the tub. Octopuses that survive infancy in the real world grow to maturing quickly, but have a short lifespan -- and those here at the farm may live just two to three years. It's not easy being a mottled brown, or in an instant chalky white or some other color cephalopod. Almost forgot to mention they change color in a flash as a defensive -- or offensive -- tactic. Strange critters, indeed. 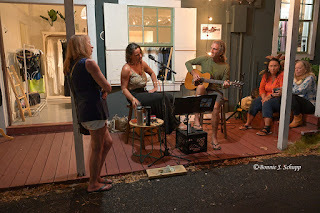 We headed for the hills near sunset for the monthly First Friday Art After Dark celebration in Holualoa Village, about five miles from and perhaps 1,500 feet above the beachfront town of Kona. And we were not alone. 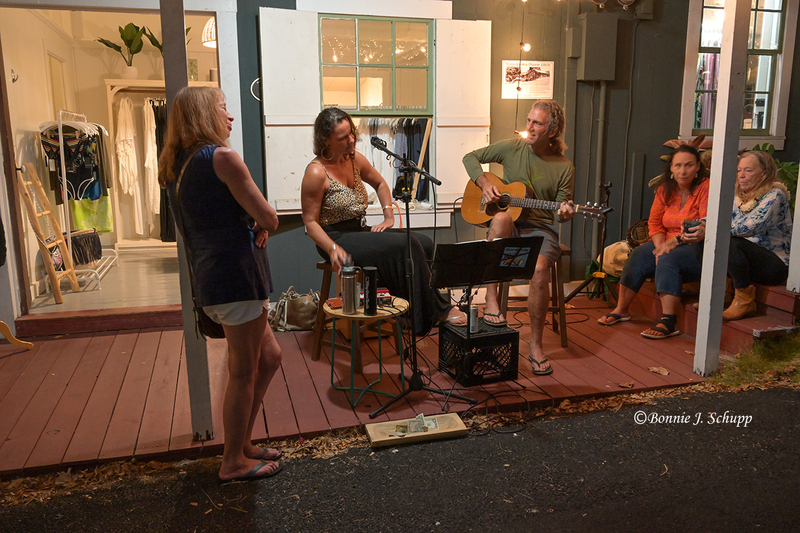 Over the past couple of years, a small event has become a huge happening -- hundreds of people exploring a quarter-mile stretch of the village's main street, lined with art galleries and shops, lining up for dinner or snacks from a variety of food truck-style vendors, and close to a dozen musical performers. Some shops offered free snacks, and two were dispensing iced hibiscus tea... and it was terrific. The artwork was largely high-end quality, with prices ranging from under a hundred dollars into the thousands, The most expensive seemed to be, of all things, an excellent sculpture of... wait for it... an octopus, crafted from recycled material. It was priced at $12,000 -- a little higher than a sea turtle by the same artist, at $8,000. 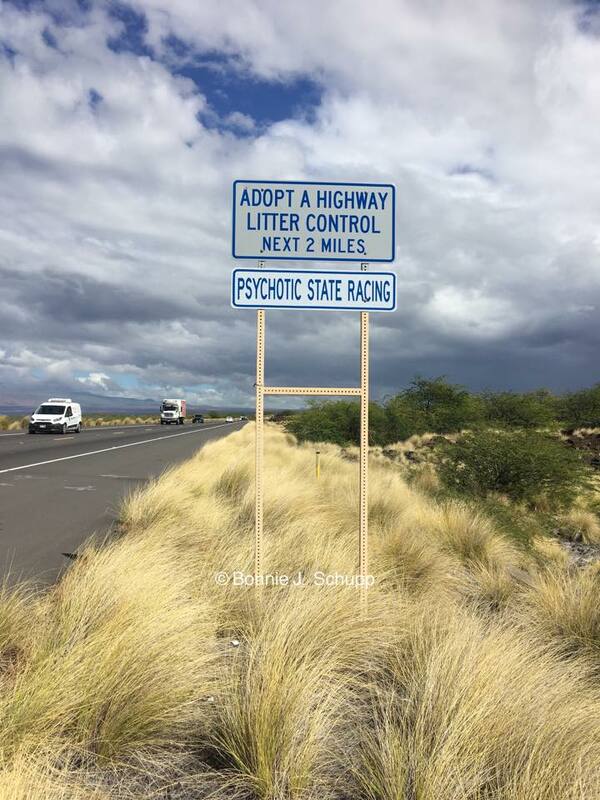 Driving back from the north near sunset Thursday, I noticed an odd sign along the coastal Route 19. With a spare half hour before our octopian encounter, we headed about 10 miles past the airport to find it in the early afternoon. And I found one facing the northbound traffic above a mile and a half above a donkey-crossing zone on the 55 mph highway. 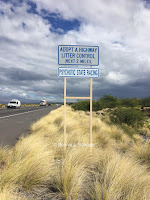 It was one of those adopt-a-highway, litter-fighting signs with local sponsors. This one stood out, though, from the likes of company names or civic group, reading: Psychotic State Racing. Bonnie took the picture, and on our way back to the octopus farm entrance road she Googled the name -- turns out, it's a local car fancier group with a sense of humor. She posted the picture on Instagram, and the group replied online with its appreciation.